This is a wonderful Georgian silver brooch, dating to the 18th - 19th century. It resembles an "Ouch" a 16th century Tudor brooch worn in hats or pinned onto doublets by the Renaissance nobility. It is likely a revival piece of the Renaissance or produced by a jeweller inspired by Holbein. 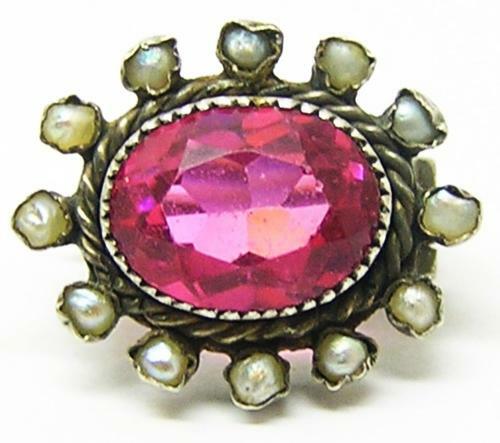 The jewel is set with a central pink gem (faceted glass imitative of a ruby), surrounded with a halo of split pearls. The pearls are original freshwater examples. The pin has a hinge and 'C' clasp. Altogether a fine diminutive jewel, of excellent design and condition. PROVENANCE: Ex. Property of private collector, Chippenham.